Three doctors in physics from the Universitat Jaume I (UJI) have patented a humidity sensor for the optimization of irrigation, whose main innovation lies in taking into account the humidity conditions of the soil, that is, if it has rained, it is cloudy or the sand is dry enough. focused to decrease the irrigation water consume in whatever application, from agriculture to greenhouses, gardens, golf courses, etc. In fact, the sensor has started to be used in a golf course in Castellón province. 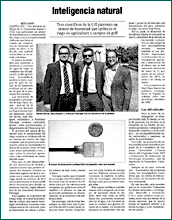 Patent inventors and Xop Física promoters, a spin-off company of the UJI, are the doctors in physics Germà García Belmonte, lecturer, Juan Bisquert, professor, and Francisco Fabregat, doctor contracted professor, all of them belonging to the Physics Departement of the UJI. Humidity sensor for the irrigation optimization project consists on the development of a whole irrigation control system that provides information about the hydric requirements of the plants, in base both to the environmental data and to the sand humidity conditions, where lies the main contribution.